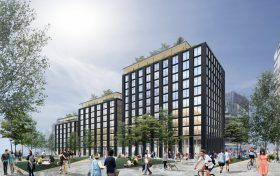 Lotus Equity Group announced on Monday plans to bring the largest mass timber office building in the United States to the Newark waterfront. Michael Green Architecture has been tapped to design the 500,000-square-foot office building made with a wooden structure for Riverfront Square, a massive mixed-use development proposed for the Broad Street corridor of the Jersey neighborhood, according to the Wall Street Journal. The building will rise in three separate sections to six, eight and 11 stories tall and have a concrete foundation. Its columns, exterior panels, elevators, stairwells and floor systems will be made of mass timber. Interiors will boast exposed wood with a facade covered in metal panels, brick or wood.